Antelope Creek ranks right up there with the North Fork Smith as one of the most scenic class III-IV runs in California. Kind of a poor man's Deer Creek, this run is suitable for intermediate boaters, who can experience scenery just as stunning as on Deer Creek, all in the space of one long day. 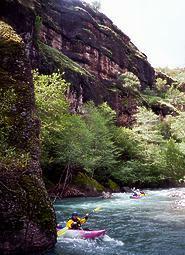 There are also many fine wilderness campsites if you prefer a more relaxed pace. The wildflower display is excellent in late winter or early spring. This is a run containing fast moving water and class II-III rapids most of the way, tapering off only when it emerges into the Sacramento valley about 3 miles from take-out. Scenery and solitude are superb, and water quality is excellent, so it is surprising that this river didn't make it into any guidebook. Until 2003, you could not legally run this creek in February or March, the best months during dry years. The policy of closing Payne Place road for Blacktail Deer mating season (ha ha) was apparently changed in 2002. Flow information is not available, but two ways to estimate are by taking 50% of Battle Creek, or 60% of Deer Creek. Like Deer Creek, Antelope Creek's volcanic bedrock soaks up water, so flows remain relatively moderate after big rainstorms. There is some snowmelt, but Antelope's drainage is lower and smaller than Deer Creek, so be suspicious near the end of season. Old-timers say that Antelope Creek is boatable down to 400 cfs, but we ran everything in IKs at 250 cfs (April 2000) and came away happy. 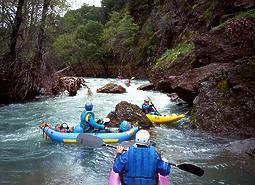 Put in near the campground rest rooms, where a trail descends to the creek amid poison oak. A class IV- rapid comes almost immediately, caused by rockfall from a cliff on the left, then a small eddy, then a class III washboard rapid. If you need warmup, put in at the low-water crossing .5 mile downstream. Metal grate ford creates a low-water crossing, runnable on the left or on the far right. Alternate (easier) put-in. A cliff on the right bank and a large lava boulder hide this rocky drop. The left channel, which at first appears to be a sneak route, is blocked by a tree (1998). Sign on right bank showing boundary of Lassen National Forest and the State of California's Tehama Wildlife Management Area. Two metal-towered high tension power lines pass overhead. This long and steep class IV rapid starts below the downstream overhead line. 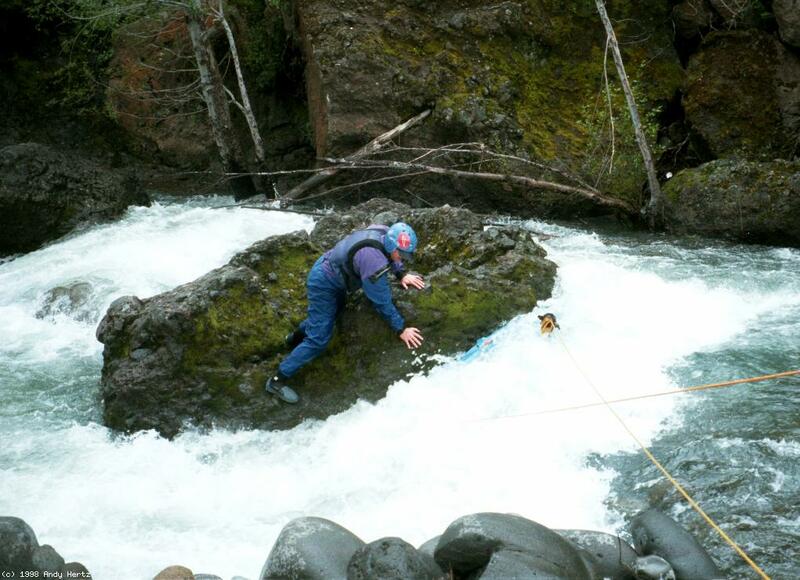 The initial 5' falls is rather twisty, and the second drop leads into a hole with a wrap rock downstream. After a small eddy, most passages are blocked by a large tree, although a tight squeeze is available on the far right (2000). Whitewater continues into a turbulent exit along the right bank cliff. Portaging is possible: start on the right, ferry across, and finish on the left. The canyon opens up, and Cameron Creek trickles in the right. Facht Place, an old homestead, and unnamed creek on the right. Poured cement creates another low-water crossing, runnable in the center. Alternate (easiest but involving 4WD) put-in. Move left to avoid a rocky channel on the right. The creek widens into a high-water boulder bar, but at normal flows the entire river flows rightward into a curving tree-lined channel that obscures a large undercut wrap rock in the center channel. If you make it left of this rock you find a manageable route (with minor undercut below), but if you don't, you face tricky hydraulics and several possible narrow passages. 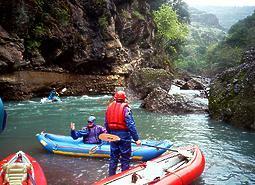 Wide or unmaneuverable rafts should stop upstream and line this. Easy portage on the left. Fast water continues into a class III rapid around the bend. Rapids taper off to class II for several miles, passing thru many intimate lava canyons decorated with wildflower gardens. The creek splits around islands several times. Little Grapevine Creek enters on the left. 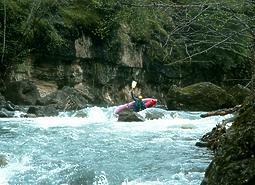 Some distance below, a boulder-choked class III drop can be tight for rafts. 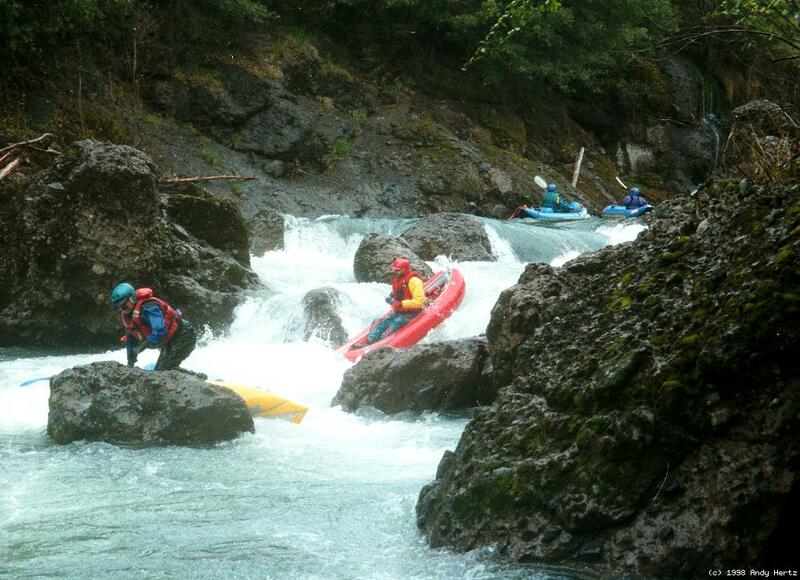 Class II rapids continue for several miles. Down tree (2000), easy portage on the left. Might have disappeared in the meantime; here is a picture. The canyon walls steepen, signaling some class III rapids ahead. This area is called Devil's Half Acre on topographic maps. 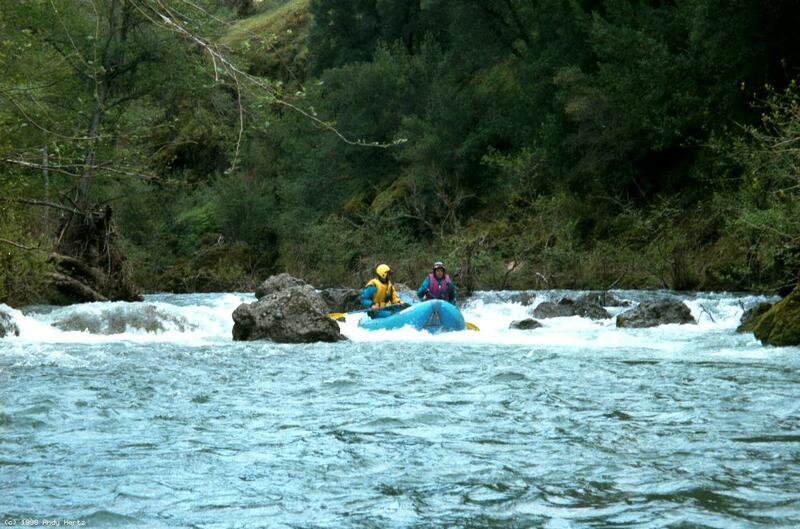 The river seems to disappear into a field of large lava boulders. An initial blind passage on the right is followed by several more maze-like jumbles of lava boulders blocking the creekbed. You might want to scout, checking for logs in the narrow channels. Rafts must zigzag thru wider channels, and at one point might need to tip up on one tube. 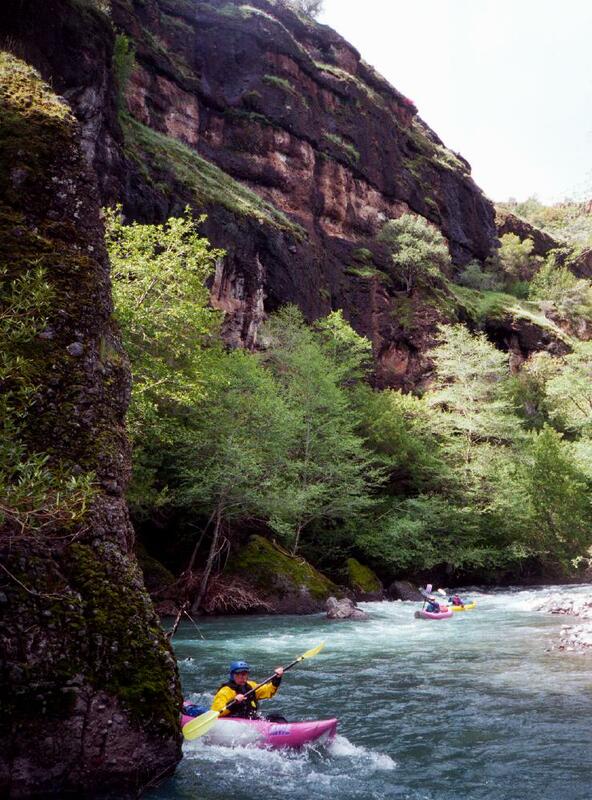 Kayaks have an easier time here. 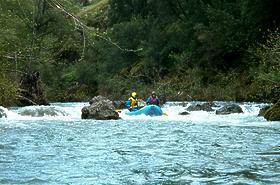 After a curving gravel bar rapid on the left, the channel is blocked by two large boulders. 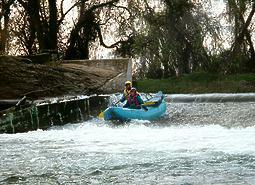 The channel on the left is turbulent and challenging, but blocked by a log (2000), while the channel on the right is tight but smoother. The middle channel might be runnable at higher flows, when this rapid is reported to be class IV. The canyon starts to open up, and basalt flows become visible. Rapids taper off to class II again. The remains of a dam, which destroyed Antelope Creek's salmon and steelhead runs and was dynamited years ago by Fish & Game, starts ruining the canyon's wilderness feel, as rusty diversion pipes follow the right bank starting here. The dam is runnable on far right (2000) and whitewater continues thru the concrete rubble and rebar below. 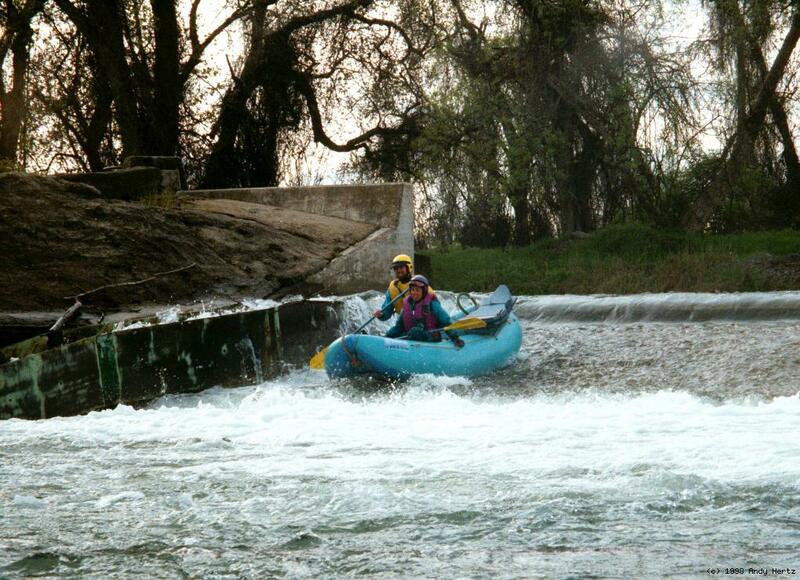 After a brief respite, class III rapids continue around the corner. 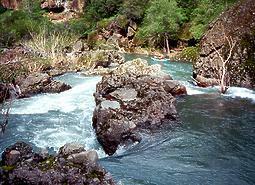 The river flows thru a narrow channel in the lava bedrock (as on Mill Creek), then into a mini Coffeepot (as on the Rogue River), with high walls on either side of a narrow channel. Shortly below is Grafitti Rock, where you can observe petroglyphs drawn by local Red Bluffians, who sometimes practice target shooting nearby. The Hogsback, an unusual lava ridge high on river right that can be fully appreciated only by driving a short distance up Hogsback Road. 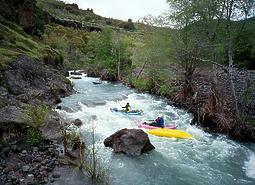 Class II rapids continue, until the river emerges from its canyon, first on the right, and then on the left. 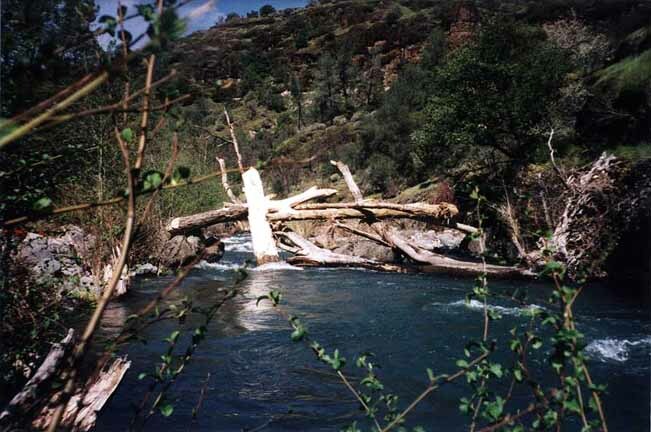 The river veers left at a concrete diversion dam with a potentially dangerous reversal below (danger varies depending on gravel depth at the base of dam). Possible portage on the left. It seemed safe to run a tongue on the right (1998). After a succession of drought years, there could be strainers and willow infestations below the diversion dam, as there were in 1995. Highway bridge below Cone Grove Park. There is a good gravel bar take-out on river left just before the bridge. To reach take-out, go east from I-5 at Red Bluff on highway 36/99 and continue south on 99 for 3 miles. Turn left onto Cone Grove Road, and proceed 2 miles to Cone Grove Park. Restrooms available, no camping. To reach put-in from there, return to highway 36, and drive 20 miles to Payne Creek. Turn right on Payne Creek Road, then soon turn right again onto Plum Creek Road. Wind uphill for about 5 miles, past Ishi Conservation Camp. Turn right on Oak Creek Road (dirt), marked with a sign saying “Hogsback Road 2 miles/ Finley Lake 3 miles”. After about 2 miles, turn right at a T junction onto Hogsback Road, which might not be marked; do not take the bad 4WD road (marked Antelope Creek) straight downhill. On Hogsback Road, proceed (past Finley Lake) about 2 miles to just beyond a fence marking the boundary of Lassen NF. Turn left onto an unmarked road, which leads to Payne Place. Descend several miles to a fine free campground (with pit toilet) along Antelope Creek. For boaters wishing to avoid the class IV rapid, there is another put-in. With a 4WD high-clearance vehicle, you can reach the alternate put-in down another unmarked road (gated until April in years past) by continuing 6 miles west on Hogsback Road. This 4WD road is worst at the hairpin turn not too far from the top. If your vehicle won't make it, the carry down to the river is feasible with kayaks but not easily with rafts.